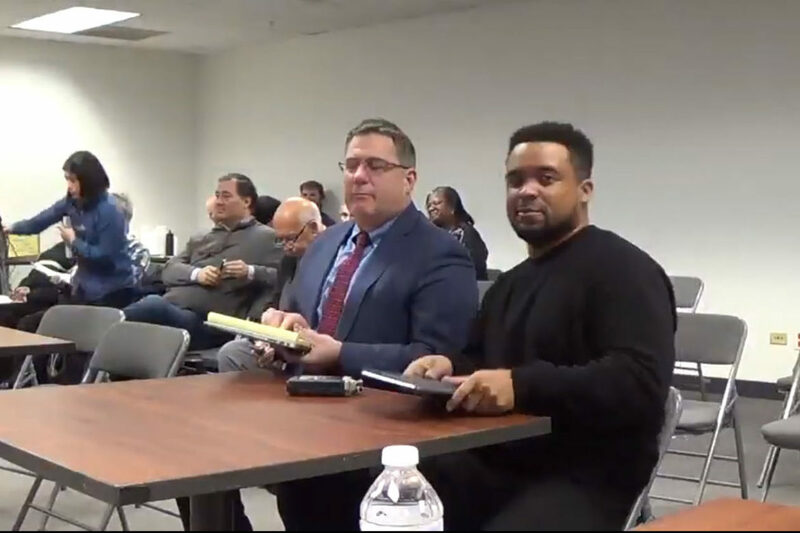 The Chicago Board of Election Commissioners unanimously allowed Neal Sáles-Griffin to remain a mayoral candidate on Tuesday, January 22, 2019, after fellow candidate Willie Wilson withdrew his petition challenge. Despite disputes over the validity of more than 2,300 signatures, Neal Sáles-Griffin will be the fourteenth candidate on the ballot for mayor of Chicago. That Tuesday decision, which election experts call “a first,” is even more surprising considering that minutes earlier the Chicago Board of Election Commissioners dropped veteran politician and Clerk of the Circuit Court of Cook County Dorothy Brown from the ballot based on a challenge of about 950 signatures. While the first round is conducted by clerks, who attend several hours of training with handwriting experts, the second round is completed entirely by handwriting experts, the board said. “I think that is one of the biggest flaws in the system. My opinion is they should only have handwriting experts judge these,” she said. If Brown’s hearing exposed a flaw, Sáles-Griffin’s hearing exposed the folly. Chicago Electoral Board Chair Marisel Hernandez lectured Willie Wilson’s mayoral campaign for challenging Sáles-Griffin’s signatures then dropping it at the “11th hour.” While Wilson also dropped his objection to Brown’s signatures, Toni Preckwinkle did not. Last week, Chicago Board of Elections hearing officer Christopher Agrella refused to drop Wilson’s challenge noting Sáles-Griffin was 2,342 below the required minimum of 12,500 signatures and recommended the Board of Commissioners sustain Wilson’s objection, which would kick Sáles-Griffin off the ballot. Tuesday’s decision was a rebuke of that recommendation with the board voting to dismiss the original objection based on its “bad faith and frivolous nature,” placing Sáles-Griffin on the ballot. “I planned for either outcome. In our mind, it was a 50-50 chance, but I actually didn’t have to say a single word. They are operating under good faith and I respect that,” said Sáles-Griffin. A candidate ending up on the ballot with contested signatures is “a first,” according to Jim Allen, spokesman for the Chicago Board of Elections. The board’s hearing officers can file their own objections to petitions that at face-value don’t meet the “standards of apparent conformity,” or appearing to follow the rules. For example, the board booted Richard Mayer for only submitting one signature and Sandra Mallory for turning in multiple binders instead of one. On the other hard, the petitions materials submitted by Sáles-Griffin’s “meets the standards of apparent conformity” so an objection wasn’t filed by hearing officers, Allen said. Though he’s begun to resent his branding as “the tech guy,” Sáles-Griffin said he built three tools to help him verify the signatures his campaign collected. It took a month working 12-hours a day for five days, but he was able to to review the signatures himself, he said. He’s also been documenting his candidacy through a podcast. “This is what I’ve been doing with my time,” Sáles-Griffin said. The discrepancies with Sáles-Griffin submitted signatures were revealed after the Wilson’s team filed a nominating petition challenge against him and at least four other candidates. The challenges got Catherine Brown D’Tycoon and Chicago Police Officer Roger Washington kicked off by election officials and forced activist Ja’Mal Greene to withdraw. But, in recent weeks, the campaign has dropped objections against Brown, State Rep. LaShawn Ford and Sáles-Griffin. The board made special note of the Ford case in explaining its lecture on the campaign’s pattern of bad faith and abuse of the petition challenge system. “Together [the Sáles-Griffin challenge and Ford challenge] cases involve tens of thousands of line objections that our board personnel and the hearing officers had to comb through. All of this activity proved frivolous. Together these two objection cases have derailed this election,” said Hernandez. Going through the petitions has caused delays in other cases, delayed the launch of early voting and delayed the board’s ability to print vote-by-mail ballots. It also harmed Sáles-Griffin’s campaign, she said. While the board took issue with his reasoning for withdrawing, which included wasting taxpayer money and that Sáles-Griffin was “nice,” Wilson stuck by his team’s decision to withdraw. “I thought he was young, had the right attitude and he’s a nice kid. We want him to be involved,” Wilson said. Despite the board’s issues with his challenges, Wilson has moved back on to campaigning. While she wouldn’t get into a specific candidate, Brown said her team would be meeting with mayoral candidates and aldermanic candidates in preparation to throw her support behind them. Prior to closing the meeting Tuesday, the Board of Commissioners promised to work to change the law and seek financial sanctions for bad faith objectors. Josh is a reporter for The Chicago Reporter. Email him at jmcghee@chicagoreporter.com and follow him on Twitter @TheVoiceofJosh. An increasing commitment to reentry in Illinois by the public sector might point the way for private sector employers.